The Securities Commission of The Bahamas celebrated two landmark events this past year: its 20th year of operation and the appointment of a new executive director, Christina Rolle (pictured). Rolle, who has over 20 years experience in financial services, took up the position in January 2015 and wants her tenure to be characterized by expansion and growth. She talks exclusively to The Bahamas Investor about EU blacklists, what The Bahamas can do to ride out recent global volatility and how the Securities Commission’s role is constantly evolving. Q: You have been the commission’s executive director for a year now, how have you settled into the role? A: I think I have settled in well. I chose the approach of baptism by fire, meaning I wanted to get up to speed very quickly on issues relating to the legislative, regulatory and operational aspects of the commission. In my first six months, I tried to tackle a couple of easy wins. Segregation of cash was one issue that was long-outstanding. That is one issue I think we are well on our way to resolving. 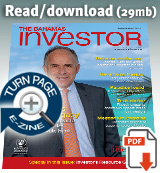 The second issue we tackled is the suitability of client investments. That was a big concern for the industry. Again, we are well on our way to resolving that. Those were easy wins. They got me started off on the right foot and I think they helped towards our goal of engagement with industry. With respect to my team, I feel fortunate that the commission has managed to recruit very highly-skilled, hard-working staff. My background is in industry and find it refreshing to see that the staff at the commission have a sincere belief in, and a commitment to, what they do. For me, that is half the battle won. There are things I am still learning and discovering, but I hope the learning process is continual throughout my term. One of the big selling points of the job is that you are constantly learning and solving challenges. You are really on the ground, shaping the industry and that is something a job in the private sector won’t necessarily give you. I get to be a part of the solution and make a lasting impact for the better. Q: How has your background in financial services helped prepare you for this position? A: I have about 20 years experience in financial services, mostly in large private international banks in The Bahamas. My experience has been broad and about four of those years were spent as head of risk, compliance and corporate governance for Socíeté Generale. I believe that my industry experience enables me to look at regulatory issues practically, which has been useful in getting to the bottom of some of those tough, long-standing issues. I believe I have had a shorter learning curve because I have a technical grasp of why and how our licensees operate. Q: How do you balance the needs of industry, regulators and government? A: The government has an interest in the economic development of The Bahamas. 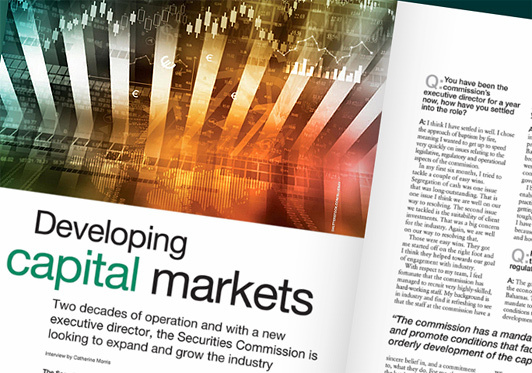 The commission has a mandate to create and promote conditions that facilitate the orderly development of the capital markets. When we focus on that purpose, we don’t compete with industry. We see our role and our purpose as ensuring the integrity of the markets to facilitate business. Industry sees that our role is important, because when we ensure the integrity of the regulatory environment, we legitimize what they do. It creates an environment that healthy business would be attracted to, and enables them to thrive and develop. So I think those interests do not necessarily have to compete. Q: How would you characterize today’s investment climate? A: In the Bahamian capital markets, there is decreased lending on the part of the banks. As a result the banks have quite a bit of excess cash. That is not good for The Bahamas’ economic growth. Also, what we see in The Bahamas–and some local institutions have been talking about this for years–is that there is a terribly low household savings rate. We all know that for our capital markets to develop you need a higher savings rate. The commission has been making some efforts this year specifically targeted to help students and households start thinking about savings. Then the next step would be to get them thinking about investing. Q: How important is it for the commission to engage with regional and international partners? A: International engagement is very important to build and expand the capacity of the commission. Our staff are very keen and clever, but often they find themselves operating in a vacuum. When we have opportunities to learn from regulators such as the US Securities and Exchange Commission (SEC), which oversees the largest capital markets in the world, we want to jump on those opportunities. We engaged with the SEC early in 2015 and requested a week-long training programme to be conducted in The Bahamas. It was a very productive programme and we got excellent feedback. We intend to have this on an ongoing basis, probably once every few years as information gets refreshed. We became chair of the Caribbean Group of Securities Regulators (CGSR) in April 2015. Our term is two years. The Bahamas, therefore, will lead the CGSR agenda for the next two years and host its annual meetings. This is a way to increase our visibility. With the exception, perhaps of the Cayman Islands and Bermuda, we are leading the rest of the Caribbean in many aspects of our securities legislation. Jamaica and Trinidad do have more developed capital markets than we do, however, so it is an opportunity for us to learn from them and also share what we know and what we do better. It gives us an opportunity to lean in, give our voice and give our experience. Q: And how important is it to work with industry bodies at home? A: Extremely important. We have met with most of the industry groups. We have even gone a step further and launched a courtesy call initiative with the industry. We are going through our list of licensees and registrants and having meetings with every one of them. It is not the traditional regulatory meeting where we are telling them what’s wrong. It is a meeting where we get to hear about their operations in a friendly environment and they get to tell us their concerns. We see this as positive engagement. Q: How has the commission’s role evolved over 20 years? A: The commission began as The Securities Board. The role back then was mostly focused on the mutual funds industry and the licensing and supervisory regimes were very rudimentary. During that time there was quite a bit of activity also in local capital markets with a number of IPOs being launched. The commission has seen that as international standards developed and as we became members of international bodies, we had to take on the priorities of those bodies. That has sometimes been painful in many aspects of the industry, but it really is the new way to operate. We have seen increased focus on international requests for information with respect to insider trading, anti-money laundering, counter-terrorism financing. We will probably continue to see more focus on that. Legislatively, we are prepared for that. If you ask our licensees they may say we are stricter than some large, developed countries, but there are always areas where we can do even better. Q: What kind of challenges does The Bahamas face as a smaller, offshore jurisdiction? A: Our population is obviously very small. We will have to expand our capital markets for international reach if we want to really take advantage of the development, and the funding for development, that can come through capital markets. Also, sometimes as a small jurisdiction you get beaten up on. We see that in this latest EU blacklisting where we were arbitrarily named by ten countries and then, voila, we’re on the list. With respect to that list, many jurisdictions agree it is too arbitrary to be taken seriously. But that’s today. Who knows what traction that list will gain in another few months. The Bahamas needs to reframe our story from the view that this is the place people come to hide money or engage in market misconduct. We need to focus on shaking the stigma of that. Q: What would you like to achieve during your time as the commission’s executive director? A: I would like to see expansion and growth within the scope of the commission. That means we are going to have to play a more active role in the development of the capital markets. We need to continue to adapt our legislative and regulatory platform; not only to meet international standards, but also to enable an environment that would attract and sustain business. We need to keep on top of international standards of best practice so as to provide guidance to the industry. We need to keep in step with developments so The Bahamas is not left out of the race altogether.